On behalf of the State Council, I will now report to you on the work of the government and ask for your deliberation and approval. I also wish to have comments on my report from the members of the National Committee of the Chinese People's Political Consultative Conference (CPPCC). In the past year, China's development has faced grave challenges posed by a great many problems and interwoven risks and dangers both at home and abroad.However, under the strong leadership of the Central Committee of the Communist Party of China with Comrade Xi Jinping at its core, we the Chinese people have risen to the challenge and worked hard to press ahead, driving forward sustained, healthy economic and social development.At the Sixth Plenary Session of the 18th Party Central Committee,the core position of General Secretary Xi Jinping was formally affirmed, which reflects the fundamental interests of the Party and the Chinese people, and is of crucial and far-reaching significance for ensuring the flourishing and long-term stability of the Party and the country. All regions and all government departments have steadily strengthened their consciousness of the need to maintain political integrity, think in big-picture terms, uphold the leadership core, and keep in alignment.Pushing ahead with all-around efforts, we have achieved major progress in finishing building a moderately prosperous society in all respects, made important strides in deepening reform, continued to exercise law-based governance, and made further progress in practicing strict Party self-governance; and we have accomplished the year's main tasks and targets for economic and social development, and got the 13th Five-Year Plan off to a great start. The economy has registered a slower but stable performance with good momentum for growth. GDP reached 74.4 trillion yuan, representing 6.7-percent growth, and seeing China outpace most other economies. China contributed more than 30 percent of global growth. The CPI rose by 2 percent. With an 8.5-percent increase in profits, industrial enterprises reversed the previous year's negative growth of 2.3 percent. Energy consumption per unit of GDP fell by 5 percent. Economic performance improved markedly in quality and returns. Employment growth exceeded projections. A total of 13.14 million new urban jobs were added over the course of the year. The number of college graduates finding employment or starting businesses reached another record high. The registered urban unemployment rate stood at 4.02 percent at year-end 2016, the lowest level in years. For China, a large developing country with a population of over 1.3 billion, attaining this level of employment is no easy task. Continued advances were made in reform and opening up. Breakthroughs were made in reforms in major sectors and key links, and initial success was achieved in supply-side structural reform. New measures were introduced for opening China up, rapid progress was made in pursuing the Belt and Road Initiative, and a number of major projects and industrial-capacity cooperation projects with other countries were launched. Economic structural adjustment was stepped up.Consumption was the main driver of economic growth. The value created by the service sector rose to 51.6 percent of GDP. High-tech industries and equipment manufacturing grew rapidly. In agriculture, production was stable and structural adjustments were made, and we had continued good grain harvests. New drivers of growth gained strength.Further progress was made in pursuing the innovation-driven development strategy, and a number of world-leading achievements were made in science and technology. Emerging industries were thriving, and the transformation and upgrading of traditional industries accelerated. People were busy launching businesses or making innovations, with a 24.5-percent year-on-year increase in the number of new businesses registered-an average of 15,000 new businesses daily.With self-employed traders and other market entities included we had an average of 45,000 new market entities launched per day. New growth drivers are opening new prospects for China's development. Infrastructure became ever-better able to sustain development.Over 1,900 kilometers of new high-speed rail lines came into service, and more than 6,700 kilometers of expressways and 290,000 kilometers of rural roads were built or upgraded. Construction picked up pace on urban rail transit facilities and underground utility tunnels. Construction began on 21 major water conservancy projects. The number of 4G mobile communications subscribers grew by 340 million and over 5.5 million kilometers of optical fiber cables were added. Living standards were improved.Personal per capita disposable income increased by 6.3 percent in real terms. The number of people living in poverty in rural areas was reduced by 12.4 million, including more than 2.4 million people relocated from inhospitable areas. More than 6 million homes in rundown urban areas and over 3.8 million dilapidated rural houses were renovated. In tourism, domestic trips showed rapid growth, and overseas trips exceeded 120 million. People in both urban and rural areas saw arise in living standards. 2016 was an unusual year in our country's development. China was confronted with an external environment in which the world saw the lowest economic and trade growth in seven years, growing volatility in global financial markets, and sudden and frequent regional and global challenges.Domestically, China faced multiple difficulties: major structural problems, prominent risks and dangers, and mounting downward pressure on the economy. China found itself in a complex environment as reform entered a critical stage, profound changes took place affecting interests, and factors impacting social stability grew.Given all these factors, it was not easy for us to maintain stable economic performance. And yet we succeeded, and even managed to make progress on many fronts. Once again, this shows that we the Chinese people have the courage, ingenuity, and ability to overcome any difficulty or hardship. It also shows that the Chinese economy possesses potential, resilience, and strengths, so we can be sure there is even better development ahead for China. A prudent monetary policy was pursued in a flexible and appropriate manner.The M2 money supply increased by 11.3 percent, below our projected target of around 13 percent. We used a range of monetary policy tools to support the development of the real economy. Measures were taken to upgrade consumption. We unveiled policies to encourage private investment, and saw investment begin to stabilize. We exercised category-based regulation over the real estate market. We strengthened efforts to manage financial risks. The RMB exchange rate regime continued to improve, and the exchange rate remained generally stable at an adaptive and equilibrium level. With these measures, we have safeguarded China's economic and financial security. Second, we focused on five priority tasks -- cutting overcapacity, reducing excess inventory, deleveraging, lowering costs, and strengthening areas of weakness -- thereby improving the composition of supply. To help enterprises lower operating costs, we introduced measures to cut taxes and fees, lower the share paid by enterprises for social security contributions(Notes: This includes old-age insurance, health insurance, unemployment insurance, workers' compensation, maternity insurance, and housing provident fund schemes). We boosted efforts to strengthen areas of weakness and undertook major initiatives that both help to meet urgent needs today and promise long-term benefits. Third, we worked hard to deepen reform and opening up, further strengthening the vitality of development.Reform was deepened across the board, and a good number of landmark and pillar reform initiatives were undertaken. To balance the government-market relationship -- the pivotal issue in economic structural reform -- we continued reforms to streamline administration, delegate powers, and improve regulation and services. My administration's goal of cutting the number of items requiring government review by a third had been achieved ahead of schedule. On that basis, last year we cancelled the requirement on a further 165 items for review by State Council departments and authorized local governments. We also overhauled and standardized 192 items of intermediary services for government review as well as 220 items of approvals and accreditations for professional qualifications. We deepened institutional reforms in the business sector. We introduced an oversight model of random inspection and public release across the board(Note: The model comprises inspections of randomly selected entities by randomly selected inspectors and the public release of inspection results., and cut the price of electricity), made operational and post-operational oversight more effective, and promoted the Internet Plus government services model. The RMB was formally included in the IMF's Special Drawing Rights basket. The Shenzhen-Hong Kong Stock Connect was launched. We improved measures for promoting trade, and built 12 new integrated experimental zones for cross-border e-commerce, bringing about a steady recovery in the volume of import and export. The new practices of pilot free trade zones in Shanghai and elsewhere were used to establish another seven pilot zones. The requirement for review and approval for setting up and making significant adjustments to foreign enterprises was replaced by a simple filing process, with the exception of a few areas where special market access requirements apply. In 2016, China utilized more than US$130 billion of overseas investment, continuing to rank first among developing countries. Fourth, we strengthened innovation's leading role, spurring the rapid development of new growth drivers.We took further steps to implement the Internet Plus action plan and the national big data strategy, fully implemented the Made in China 2025 initiative, and implemented and improved policies and measures to encourage people to launch businesses and innovate. We developed and launched a plan for completing major science and technology programs by 2030, supported Beijing and Shanghai in building themselves into global R&D centers, and established another six national innovation demonstration zones. China's R&D spending reached 2.08 percent of GDP. The number of in-force Chinese patents issued in China passed the million mark, and the value of technology transactions exceeded one trillion yuan. The contribution of scientific and technological progress to economic growth rose to 56.2 percent, and innovation's role in powering development grew markedly. Fifth, we promoted more balanced development between regions and between rural and urban areas, and saw faster emergence of new growth poles and growth belts.We stepped up work to implement the three strategic initiatives (the Belt and Road, Beijing-Tianjin-Hebei integration, and the Yangtze Economic Belt), and began construction on a number of key projects. We formulated the plan for the 13th Five-Year Plan period for large-scale development in the western region, launched a new round of initiatives as part of the Northeast revitalization strategy, drove progress in the rise of the central region, and supported the eastern region in leading the rest of the country in pursuing development. We sped up efforts to promote new types of urbanization, deepened reform of the household registration system, introduced the residence card system nationwide, and granted urban residency to another 16 million people from rural areas. The synergy building through coordinated development became more and more evident. Sixth, we strengthened ecological conservation and made fresh progress in pursuing green development.We formulated and introduced measures for assessing progress made in ecological improvement, and established national pilot zones for ecological conservation. We took stronger measures against air pollution and, as a result, saw a 5.6-percent decline in sulfur dioxide emissions, a 4-percent cut in nitrogen oxide emissions, and a 9.1-percent drop in the annual average density of fine particulate matter (PM2.5) in 74 key cities. We continued to improve the energy mix, increasing the share of clean energy consumption by 1.7 percentage points and cutting the share of coal consumption by 2 percentage points. The State Council submitted 13 legislative proposals to the Standing Committee of the National People's Congress (NPC) for approval and adopted or revised 8 sets of administrative regulations. We improved mechanisms for drawing on public opinions in decision making on public issues and worked with keen attention to handle the proposals and suggestions of NPC deputies and CPPCC National Committee members. We made progress in strengthening government transparency by releasing lists of the powers and responsibilities of all provincial-level government departments. We carried out in earnest activities to enable Party members to gain a good understanding of the Party Constitution, Party regulations, and General Secretary Xi Jinping's major policy addresses and to meet Party standards. We worked scrupulously to ensure compliance with the Party Central Committee's eight-point decision on improving Party and government conduct, took firm action to address formalism, bureaucratism, hedonism, and extravagance, and rigorously enforced the State Council's three-point decision on curbing government spending. We punished a number of corrupt officials in accordance with law, and the fight against corruption has built up irresistible momentum. As a major country, China has made outstanding achievements in its diplomacy with distinctive features over the past year. President Xi Jinping and other Chinese leaders visited many countries. They attended major international events, including the 24th APEC Economic Leaders Meeting, the Shanghai Cooperation Organization Summit, the BRICS Leaders Meeting, the Nuclear Security Summit, high-level meetings of the 71st session of the UN General Assembly, the Asia-Europe Meeting, and the East Asian leaders meetings on cooperation. We hosted the first-ever Lancang-Mekong Cooperation Leaders Meeting. China's coordination and cooperation with other major countries were strengthened, its comprehensive cooperation with neighboring countries continued to be boosted, its friendship and cooperation with other developing countries were deepened, and its interactions with the UN and other international organizations became closer. China was actively involved in reforming and improving the global governance system. We played our part in ensuring that the Paris Agreement was put into force. Economic diplomacy and personal and cultural exchanges yielded notable outcomes. We were resolute in upholding China's sovereignty, territorial integrity, and maritime rights and interests. As a responsible major country, China has been playing a constructive role in international and regional issues and has made significant contributions to world peace and development. We celebrated the 95th anniversary of the founding of the Communist Party of China and the 80th anniversary of the victory of the Long March of the Chinese Workers and Peasants Red Army, demonstrating our unshakeable will to remain true to the founding mission of the Party, to keep pressing ahead, and to overcome all difficulties, and showing the firm determination of all Chinese people to keep up our stride on the new Long March and continue striving for new victories. We owe all the achievements made over the past year to the sound leadership of the Party Central Committee with Comrade Xi Jinping at its core and the concerted efforts of the Party, the military, and the people of all our nation's ethnic groups. On behalf of the State Council, I wish to express our sincere gratitude to all our people, including public figures from all sectors of society, and to other parties and people's organizations. I express our sincere appreciation to our fellow countrymen and women in the Hong Kong and Macao special administrative regions and in Taiwan, and to Chinese nationals overseas. I also wish to express our heartfelt thanks to the governments of other countries, international organizations, and friends from all over the world who have shown understanding and support for China in its endeavor to modernize. Environmental pollution remains grave, and in particular, some areas are frequently hit by heavy smog. We need to further strengthen our steps to combat pollution. There are also many problems causing public concern in housing, education, healthcare, elderly care, food and drug safety, and income distribution. It is distressing that there were some major accidents in the coal mining, construction, and transportation sectors. We must confront these challenges head-on, be ready to bear the weight of responsibility, and do our all to deliver. We must fulfill our historic mission and live up to the great trust placed in us by the Chinese people. The developments both in and outside of China require that we are ready to face more complicated and graver situations. World economic growth remains sluggish, and both the deglobalization trend and protectionism are growing. There are many uncertainties about the direction of the major economies' policies and their spillover effects, and the factors that could cause instability and uncertainty are visibly increasing. China is at a crucial and challenging stage in its own development endeavors, and there are many salient challenges and problems in the economy. The difficulties we face are not to be underestimated, but we must remain confident that they will be overcome. China has a solid material foundation, abundant human resources, a huge market, and a complete system of industries. It is making faster scientific and technological progress, and has a complete range of infrastructure. We have good conditions for sustaining economic development, and many innovative tools and policy options for conducting macroeconomic regulation. We should follow the leadership of the Party, uphold the Party's fundamental political guidelines, and keep to the path of socialism with Chinese characteristics;we should rely on the inexhaustible creativity of the people, unite as one, and forge ahead. It is our firm belief that by doing this, we will make great new achievements in China's development. The projected target for this year's growth is realistic and in keeping with economic principles; it will help steer and steady expectations and make structural adjustments; and it will help achieve the goal of finishing the building of a moderately prosperous society in all respects. An important reason for stressing the need to maintain stable growth is to ensure employment and improve people's lives. As employment pressure grows this year, we will continue to give top priority to creating jobs and implement a more proactive employment policy. This year's target for urban job creation is one million more than last year, underlining the greater importance we are attaching to employment. Considering our sound economic fundamentals and the capacity they bring for job creation, with hard work, this target is attainable. This year, we will continue to pursue a proactive fiscal policy and a prudent monetary policy. On the basis of conducting range-based regulation, we will focus more on targeted and well-timed regulation and increase the foresight, precision, and effectiveness of our regulation. We will strengthen coordination of consumption, investment, regional, industrial, and environmental protection policies, and ensure the economy performs within an appropriate range. We will pursue a more proactive and effective fiscal policy. This year's deficit-to-GDP ratio is projected to be 3 percent, with the fiscal deficit set at 2.38 trillion yuan, representing a year-on-year increase of 200 billion yuan. To break this down, the projected deficit of the central government is 1.55 trillion yuan, and the projected deficit of local governments is 830 billion yuan. Local government special bonds to be issued will total 800 billion yuan, and local government bonds will continue to be issued to replace their outstanding debt. The main reason for keeping this year's deficit-to-GDP ratio unchanged is to allow for further reductions in taxes and fees. Over the course of the year, the tax burden on businesses will be further eased by around 350 billion yuan, and business related fees will be further cut by around 200 billion yuan to benefit market entities. We will continue to pursue a prudent and neutral monetary policy. The M2 money supply and aggregate financing are forecasted to grow by around 12 percent in 2017. We will apply a full range of monetary policy instruments, maintain basic stability in liquidity, see that market interest rates remain at an appropriate level, and improve the transmission mechanism of monetary policy. We will encourage a greater flow of financial resources into the real economy, particularly in support of agriculture, rural areas, and farmers, and small and micro businesses. The RMB exchange rate will be further liberalized, and the currency's stable position in the global monetary system will be maintained. First, we should make progress while maintaining stable performance and keep our strategic focus. Stability is of overriding importance. We should ensure stable growth, maintain employment, and prevent risks. To ensure overall economic and social stability we must not allow the redline to be crossed concerning financial security, people's wellbeing, or environmental protection. We should, while maintaining stable performance, endeavor to make progress, deepen reforms, accelerate structural adjustments, be prepared to take on some really tough problems, and push to make progress in key areas. Third, we should expand aggregate demand as appropriate and improve its efficacy. China's potential domestic demand is enormous, and it is both necessary and possible for domestic demand to be expanded. The key is to know where to start. We need to increase consumer spending to improve people's lives, and boost investment to strengthen areas of weakness and sustain development, so that the expansion of domestic demand becomes more effective and sustainable and supply-side reform and demand-side regulation reinforce each other. Fourth, we should rely on innovation to replace old growth drivers with new ones and speed up structural improvement and upgrading. Having reached the current stage of development, China can now advance only through reform and innovation. We have the largest quality workforce as well as the largest pool of scientists, engineers, and professionals in the world, and their potential for innovation is truly tremendous. We must continue to draw strength from reform and opening up, fully tap the potential of human resources and human capital, and move more quickly to pursue innovation-driven development. We should foster and develop new growth drivers while transforming and upgrading the traditional growth drivers, and increase total factor productivity. These steps will enable China's economy to maintain a medium-high rate of growth and China's industries to move toward the medium-high end. Fifth, we should solve prominent problems of public concern. All government work is for the people. We should keep in mind the fact that China remains in the primary stage of socialism and pursue a people focused development philosophy. Where conditions permit, we will lose no time in solving problems about which the people have great concern and which demand speedy resolution. When problems cannot be solved for the time being, we will work to resolve them over time. We must make dedicated efforts to deliver services to the people, resolve the difficulties they face, promote social equity and justice, and demonstrate that development does better people's lives. Take solid and effective steps to cut overcapacity.This year, we will further reduce steel production capacity by around 50 million metric tons and shut down at least 150 million metric tons of coal production facilities. At the same time, we will suspend or postpone construction on or eliminate no less than 50 million kilowatts of coal-fired power generation capacity in order to guard against and defuse the risks of overcapacity in coal-fired power, improve the efficiency of this sector, optimize the energy mix, and make room for clean energy to develop. We will strictly enforce all laws, regulations, and standards on environmental protection, energy consumption, quality, and safety and make more use of market- and law-based methods as we work to address the problems of "zombie enterprises," encourage enterprise mergers, restructuring, and bankruptcy liquidations, shut down all outdated production facilities that fail to meet standards, and stringently control the launching of new projects in industries that are already saddled with overcapacity. Take targeted policies to cut excess urban real estate inventory.At present, there is still excess supply in the real estate markets of third- and fourth-tier cities. We will support both local and new residents in buying homes for personal use. We need to be clear that housing is for people to live in, and local governments should take primary responsibility in this respect. We should move faster to establish robust long-term mechanisms for promoting the steady and sound development of the real estate sector and build a better housing system that gives equal weight to buying and renting, with multiple levels of demand being met primarily by the market, and basic housing support provided by the government. We will take more category-based and targeted steps to regulate the real estate market. Cities that are under big pressure from rising housing prices need to increase as appropriate the supply of land for residential use. We should better regulate housing development, marketing, and intermediary services, and keep home prices from rising too quickly in popular cities. Today several dozen million people still live in rundown areas in cities and towns. We must continue housing renovations in these areas. This year, we will renovate another 6 million housing units in these areas, continue to develop public rental housing and other forms of government-subsidized housing, base measures on local circumstances and use multiple means to increase the use of monetary compensation for those affected by such rebuilding, and improve local infrastructure and public services. With these efforts, we will help more families struggling with housing to bid farewell to rundown areas, and see that with good roofs over their heads our people move on to better lives. Carry out deleveraging in an active and prudent way.There is high leverage in nonfinancial Chinese firms. This is caused by high savings rates and the composition of financing which is primarily based on credit. While working to control overall leverage, we should focus on bringing down the leverage of enterprises. We need to see that the idle assets of enterprises are put to use, push ahead with securitization of corporate assets, support market- and law-based debt-to-equity swaps, develop the multilevel capital market, expand equity financing, and place tighter constraints on enterprises, especially SOEs, in leveraging, so as to gradually reduce enterprise debt to an acceptable level. Take multiple measures to cut costs.More small businesses with low profits will enjoy halved corporate income tax, with the upper limit of taxable annual income raised from 300,000 to 500,000 yuan. For small and medium high-tech enterprises, the proportion of R&D expenses covered by the additional tax reduction policy is to be raised from 50 to 75 percent. We will do all we can to see the intensity and impact of structural tax cuts deliver further results. The great number of charges have placed an unbearable burden on many businesses; we are going to slash non-tax burdens. Second, we will abolish or suspend 35 administrative charges paid by enterprises to the central government, again cutting the number of charges by more than half; and then reduce as far as possible those that still apply. Local governments also need to make significant cuts to government administrative fees. Take targeted and powerful measures to strengthen areas of weakness.We need to focus on salient problems that are holding back economic and social development and making it difficult to improve people's standards of living, and we should integrate efforts to undertake major projects set out in the 13th Five-Year Plan with efforts to strengthen areas of weakness. We should act faster to raise the capacity of public services, infrastructure, innovation-driven development, and resources and the environment to sustain development. We need to step up development in contiguous areas of extreme poverty, old revolutionary bases, border areas, and areas with concentrations of ethnic minorities. For this we should focus on the following work: improving infrastructure and public services; fostering poverty alleviation through distinctive local businesses, the domestic and overseas export of labor, and improving education and health care; providing assistance to people who become poor or sink back into poverty due to illness; implementing the program for improving life in poor villages; and building the self-development capacity of poor areas and people. In poor counties, different rural development funds will be merged, and oversight over funds and projects will be strengthened. We will develop new mechanisms for coordinating poverty reduction efforts. We will support and guide non-governmental participation in combating poverty. The system for ensuring responsibility is taken for poverty elimination will be effectively enforced, the strictest possible evaluations and assessments of poverty alleviation will be carried out, and stern measures will be taken to address deception, falsification, and the manipulation of numbers in poverty elimination work. We must see that the results of our poverty elimination earn the approval of our people and stand the test of time. We will continue to transform government functions.To enable the market to play the decisive role in resource allocation and to give better play to the role of government, we must deepen reforms to streamline government administration, delegate more powers, and improve regulation and service. This is a profound reform of government itself, which we need to continue to pursue with the courage to make painful self-adjustments and overcome all odds. We will fully implement the list-based management system, formulate lists of powers and responsibilities of the departments under the State Council, accelerate the extension of trials of granting market access on the basis of a negative list, and reduce the discretionary powers of the government while giving the market more freedom to take its course. We will abolish the requirement for permits for a number of production and service activities. We will deepen institutional reforms in the business sector, merge different forms of certification required of businesses into one certificate, and expand trials to separate operating permits and business licenses. We will improve the system for conducting both registration and post-registration oversight over businesses, apply the oversight model of random inspection and public release to cover all business activities, and strengthen coordinated administrative law enforcement. We will accelerate efforts to make the information systems of the State Council departments and those of local governments better connected and form a nationally unified government service platform. We will continue to reform fiscal and tax systems.We will implement and improve policies on replacing business tax with VAT across the board. We will simplify the structure of VAT rates, and undertake this year to turn the four tax brackets into three. We will create a simple, transparent, and fairer tax environment and further ease the tax burden of our firms. We will move faster to advance the reform of defining the respective financial powers and expenditure responsibilities of the central and local governments, formulate an overall plan for central and local government revenue sharing, improve the local tax system, and better regulate local government debt financing. We will step up efforts to make government budgets and final accounts more transparent to create pressure for idle budgetary funds to be put to good use. We must use funds more efficiently, and ensure every single sum is spent where it can be seen and produces results. We will advance reforms in the financial sector.We will prompt financial institutions to focus on their main business and make their services accessible to small and micro businesses, strengthen their ability to serve the real economy, and resolutely prevent them from being distracted from their intended purpose. We will make good use of policy-backed and development-oriented finance. We will move forward with the reform of rural credit cooperatives and strengthen the role they play in meeting the needs of agriculture, rural areas, and farmers. We will deepen the reform of the multi-tiered capital market, improve the basic systems of the main board, actively develop the ChiNext stock market and the new third board, and see that regional equity markets develop in a well-regulated way. We will expand channels for using insurance funds to support the real economy. We will make major efforts to develop green finance. We will give impetus to the sound development of the financial leasing industry. At present, overall, systemic risks are under control. But we must be fully alert to the buildup of risks, including risks related to non-performing assets, bond defaults, shadow banking, and Internet finance. We will take active and steady steps to advance the reform of the financial regulatory system, and work systematically to defuse major potential risks. We will ensure order in the financial sector and build a firewall against financial risks. We will deepen the reform of SOEs and state capital.We should develop a corporate governance structure (represented by legal person) that is under effective check and a flexible and efficient market-based operating system, with a view to increasing core competitiveness and making resource allocation more effective. This year we will basically complete the introduction of corporate systems into SOEs. We will deepen reform to establish mixed ownership systems, and make substantive progress in industries including electric power, petroleum, natural gas, railways, civil aviation, telecommunications, and defense. We will do more to energize the non-public sector.We will thoroughly implement the policies and measures for supporting the development of the non-public sector. We will work actively to develop a new relationship between government and business. We will encourage non-public enterprises to participate in SOE reforms. We must ensure equal rights, equal opportunities, and fair rules, and further expand market access to the non-public sector. All industries and sectors for which entry is not explicitly prohibited by laws or regulations should be open to different types of market entities; all industries and sectors that are open to overseas investment should be open to Chinese private capital; and all unjustified activities that impede fair market competition should be stopped. We will improve the property rights protection system.Protecting property rights means protecting labor, protecting invention and innovation, and protecting and developing productive forces. We will work faster to improve the property rights protection system and protect in accordance with law the property rights of economic entities under all forms of ownership and the property rights of citizens. We will encourage people to start businesses, make innovations, and create wealth, and we will inspire and protect entrepreneurship, and ensure that entrepreneurs can run their businesses and make investments with peace of mind. Activities that infringe on the property rights of businesses and citizens must be investigated and dealt with severely; anything that has been done wrong must be corrected. We will make a big push for progress in the reform of the social system.We will deepen reforms in support of change in the income distribution system. We will take steady steps to advance reform of the old-age insurance system, and allocate a portion of state capital to enlarge social security funds. We will deepen the coordinated reform of medical services, health insurance, and the medicine industry. We will introduce overall reform in public hospitals nationwide, abolish all markups on pharmaceuticals, and make coordinated progress in reforming health care pricing, staffing and remuneration, medicine distribution, and models of health insurance payment. We will continue reforms in education, the cultural sector, and public institutions to unleash society's vast potential for growth. We will deepen institutional reform to build a sound ecological environment.We will improve the functional zoning system and the mechanisms for compensating for ecological conservation efforts; we will put in place resource and environment monitoring and early-warning mechanisms; we will launch trials to improve the state natural resource assets management system; and we will introduce an overall plan for establishing a national parks system. All these efforts should provide effective institutional safeguards for building a sound ecological environment. We will promote a steady increase in consumer spending.We need to adapt to changes in consumer demand, improve our policies and measures, and create a better consumer environment. First, we need to speed up the development of service consumption. We will launch a new round of trials for comprehensive reform in the service sector, and support the non-governmental sector in providing educational, cultural, elderly care, healthcare, and other services. We will encourage development of new service models and cross-sectoral integration, combined medical and elderly care services, cultural and creative services, and other emerging forms of consumption. We will ensure paid vacations are enforced, improve tourist facilities and services, and make a big push to develop rural tourism, recreational tourism, and all-for-one tourism. We will increase information consumption including digital homes and online learning. We will see that communities and rural areas have better access to e-commerce and express delivery services, and encourage the integrated development of physical store sales and online shopping. We will work proactively to expand effective investment.We will guide more investment into fields that will help to strengthen weak areas, drive structural adjustment, encourage innovation, and improve people's lives. This year, we will invest 800 billion yuan in railway construction and 1.8 trillion yuan in highway and waterway projects. Construction on another 15 major water conservancy projects will begin; and work on major rail transport, civil and general aviation, and telecommunications infrastructure projects will be sped up. A total of 507.6 billion yuan of investment has been included in the central government budget this year. We will implement and improve policies and measures for encouraging private investment. We will continue to promote public-private partnerships, and improve related policies on preferential pricing, tax, and fee arrangements. Government must take the lead in acting in good faith and must never arbitrarily change agreements, and new officials must not disavow obligations undertaken by their predecessors. We will improve planning for regional development.We will coordinate the launching of three strategic initiatives and the development of the eastern, central, western, and northeastern regions. We will ensure related plans are well implemented and explore and adopt new measures. We will boost the development of national-level new areas, development zones, and industrial parks through innovation. We will support the economic transformation and development of areas hurt by resource depletion and severe ecological degradation. Airspace resources will be better allocated. We will speed up the development of maritime economy demonstration zones, we will move faster to develop China into a strong maritime country, and we will be resolute in safeguarding China's maritime rights and interests. We will take solid steps to pursue a new type of urbanization.We will deepen the reform of the household registration system. This year, at least 13 million new urban residents will be registered as permanent urban residents. We will speed up work to introduce the urban residence card system nationwide. We will support the development of small and medium cities and small towns with distinctive local features. We will help a number of counties and very large towns that meet the criteria to steadily develop into cities, and we will make city clusters better play their role in driving the development of their surrounding areas. We will encourage local governments to integrate their urban plans into single master plans and raise the standard of municipal planning and design. We will take more steps to reform and develop the construction industry, and improve the quality of construction projects. We will promote coordinated urban development above and below the ground, strengthen geological surveying, and begin construction on at least another 2,000 kilometers of underground utility tunnels in cities. A three-year initiative will be launched to remove the risk of flooding in highly vulnerable urban areas, further progress will be made in the development of sponge cities, and effective steps will be taken to address traffic congestion and other urban maladies. All these efforts will make our cities more attractive and function better. The real economy has always been the foundation of China's development; the task we now face is to speed up its transformation and upgrading. We will do more to implement the strategy of innovation-driven development, upgrade the structure of the real economy, and improve its performance and competitiveness. We will strengthen our capability for making technological innovations.We will improve mechanisms for providing continued long-term support for fundamental research and original research, build major national infrastructure projects for science and technology and set up technological innovation hubs, and establish platforms for sharing R&D resources. We will continue piloting reforms for all-around innovation. We will reform the system for assessing scientific and technological achievements. We will see our universities and research institutes truly operate with autonomy, ensure that incentive policies like stocks, options, and dividends are implemented, and implement the reform of the systems for managing research funding and projects. These steps should keep our scientists and engineers from being distracted and allow them to focus on their research. We will deepen reform of China's systems for cultivating talent and introduce more effective policies for bringing in talent from overseas. By welcoming the world's brightest minds to China and fully motivating our scientists and engineers, we will use innovation to accomplish great things. We will accelerate the development of emerging industries.We will fully implement our plan for developing strategic emerging industries. We will accelerate R&D on and commercialization of new materials, new energy, artificial intelligence, integrated circuits, bio-pharmacy, 5G mobile communications, and other technologies, and develop industrial clusters in these fields. We will continue to support and guide the development of the sharing economy to enable greater efficiency in the use of resources and bring greater convenience to our people. We will formulate regulatory rules for emerging industries in keeping with the principle of encouraging innovation and conducting regulation in a tolerant and prudent way, and guide and promote the healthy development of emerging industries. We will deepen reform of the statistics management system and improve statistics on emerging industries. In the age of the Internet, faster, safer, and more cost-effective information networks are crucial to the development of every sector. This year, we will do more to increase broadband speed and lower rates for Internet services. Mobile rates for domestic roaming and long-distance calls will be cancelled; rates for broadband services for small and medium enterprises will be slashed; and rates for international calls will be lowered. We will push forward with the Internet Plus action plan and speed up the development of the digital economy. I am confident that all these steps will benefit both businesses and our people. We will endeavor to transform and upgrade traditional industries.We will intensify efforts to implement the Made in China 2025 initiative, promote accelerated application of big data, cloud computing, and the Internet of Things, and use new technologies, new forms of business, and new models to bring about transformation in the production, management, and marketing models of traditional industries. With the development of smart manufacturing as our focus, we will press ahead with building national smart manufacturing demonstration zones and manufacturing innovation centers. We will work hard on the implementation of projects to build a robust foundation for industrial development and projects to develop and make major equipment, and we will make a big push to develop advanced manufacturing, thus moving toward mid- and high-end manufacturing. We will improve policies designed to turn China into a manufacturer of quality, and we will adopt a variety of supportive measures for technological upgrading and re-energize traditional industries. We will continue to encourage people to start businesses and make innovations.Our policy of encouraging people to start businesses and innovate is an effective way of creating jobs through business startups and innovation; it is an important source of strength that fosters new growth drivers to replace old ones and that upgrades the economic structure; and it is an effective channel for promoting equal opportunity and facilitating vertical social mobility. We must keep on pushing hard with this policy. We will take comprehensive steps to improve product quality.We will take a broad range of actions to raise quality, strengthening all-around quality management, building firm technological foundations for product quality, tightening quality oversight, and improving the competitive mechanism that links a firm's fate in business to the quality of its products. Quality is born of workmanship. We will promote workmanship and foster a culture of workmanship where workers have a strong work ethic and tirelessly seek improvement. We will refine our incentive mechanisms and see great numbers of Chinese workers exemplify workmanship and more Chinese brands enjoy international recognition. We will usher in an era of quality for economic development in China. We will do more to advance supply-side structural reform in agriculture, improve policies to boost agriculture and benefit farmers, and create more channels for rural residents to find employment and increase their incomes. We will ensure China's food security, see that agricultural modernization and new urbanization reinforce each other, and speed up efforts to foster new drivers powering agricultural and rural development. We will push forward with structural adjustment in agriculture.We will guide farmers in responding to market demand, increasing the supply of quality green agricultural products and the production of quality rice and wheat, and making appropriate reductions to the amount of land devoted to growing corn. We will expand trials to replace grain crop with feed crop cultivation to cover over 667,000 hectares. We will encourage the use of multiple channels to reduce excess stockpiles of corn. We will support major agricultural production areas in developing intensive processing of agricultural products, develop farm-based recreation or agritourism, extend industry chains and value chains, and step up the integrated development of primary, secondary, and tertiary industries in rural areas. We will boost the development of modern agriculture.We will work faster to see due standards are followed in agricultural production, and promote the development and protection of brand name agricultural products. We will create functional zones for grain production, major agricultural product protection areas, areas for growing quality and distinctively local agricultural products, and modern agriculture industrial parks. We will continue to improve rural land, upgrade low- and medium-yield cropland, and spread dry-farming techniques, adding 1.33 million hectares of farmland under highly water-efficient irrigation. We will strengthen the protection of cultivated land and improve work to offset cultivated land used for other purposes. Developing appropriately scaled, diversified farming operations is vital for Chinese-style agricultural modernization, and these operations need to be covered by agricultural insurance. This year, in selected counties and county-level cities in 13 major grain-producing provinces, we will provide catastrophe insurance for farmers engaging in appropriately scaled farming operations. We will channel a portion of budgetary disaster relief funds into this initiative and expand the coverage and raise the benefits of the insurance scheme. We will improve the agricultural reinsurance system. We wish to use sustainable and sound agricultural insurance schemes to drive the development of modern agriculture. We will deepen rural reforms.We will take steady steps to reform the rural collective property rights system and deepen the pilot reform of the rural land system to see our farmers are granted more property rights.We will improve pricing mechanisms for grain and other important agricultural products as well as the system for their purchase and storage. We will carry out comprehensive reform of the pricing for water used in agriculture. We will deepen reforms related to collective forest tenure, state forestry areas and farms, state-owned farms, and rural supply and marketing cooperatives. We will strengthen the development of rural community-level organizations. We will improve the mechanisms for encouraging business startups and innovation in rural areas, train more professional farmers of new kinds, support migrant workers in starting businesses in their hometowns and villages, and take further measures to encourage college graduates, demobilized military personnel, and scientists and engineers to work in rural areas. We will step up the development of public facilities in rural areas.A total of 200,000 kilometers of roads will be upgraded or built in rural areas. We will see that all rural areas have a steady and reliable supply of power and that all electric pumpsets on rural flatlands are connected. Fiber-optic broadband will be extended to 30,000 administrative villages. We will increase water supply to better ensure access to safe drinking water. We will intensify efforts to renovate dilapidated houses and improve rural living environments. Our goal is to develop rural China into a place where people can enjoy both the beauty of the countryside and the conveniences of modern living. Faced with new changes in the international environment and the new requirements of China's development, we need to further refine our strategic plan for opening up, work faster to build new systems for an open economy, and drive China toward both deeper and higher level opening up. We will make solid efforts to pursue the Belt and Road Initiative.Guided by the principle of achieving shared growth through consultation and collaboration, we will accelerate the building of overland economic corridors and maritime cooperation hubs, and establish cooperative mechanisms for achieving compatibility in customs clearance procedures along the routes. We will deepen international industrial-capacity cooperation, promoting the export of Chinese equipment, technologies, standards, and services, to see that China and other countries are able to draw on each other's strengths. We will strengthen personal and cultural exchanges and cooperation in education, science and technology, culture, healthcare, and tourism. We will see that in holding the Belt and Road Forum for International Cooperation we offer a meeting of real quality, opening the page on a great new chapter of mutually beneficial cooperation. We will ensure that foreign trade continues to pick up and register steady growth.We will implement and improve our import and export policies and optimize imports and exports. We will expand the coverage of export credit insurance and provide export financing insurance for all insurable complete sets of large equipment. We will move ahead with trials to develop services trade through innovation and establish a seed fund to encourage innovation to develop services trade. We will make big moves to improve the environment for foreign investors.We will revise the catalog of industries open to foreign investment, and make service industries, manufacturing, and mining more open to foreign investment. We will encourage foreign-invested firms to be listed and issue bonds in China and allow them to take part in national science and technology projects. Foreign firms will be treated the same as domestic firms when it comes to license applications, standards-setting, and government procurement, and will enjoy the same preferential policies under the Made in China 2025 initiative. Local governments can, within the scope of the powers granted them by law, adopt preferential policies to attract foreign investment. We will build 11 high-standard pilot free trade zones, and widely spread practices developed in these zones that are proven to work. We will guide the sound and standardized development of Chinese overseas investment, and increase the ability of Chinese companies to hedge against risks. China's door is going to keep on opening wider, and China will keep working to be the most attractive destination for foreign investment. We will promote the liberalization and facilitation of international trade and investment.Economic globalization is in the fundamental interests of all countries. China will not shift in its commitment to promoting global economic cooperation, will uphold the multilateral trading regime as the main channel of international trade, and will play an active part in multilateral trade negotiations. China is ready to join hands with the other countries involved to fully put into force and implement the Protocol to Amend the Framework Agreement on Comprehensive Economic Cooperation between China and ASEAN, to conclude talks as soon as possible for the Regional Comprehensive Economic Partnership agreement, and to advance the development of the Free Trade Area of the Asia-Pacific. We will continue to negotiate investment and trade agreements with relevant countries and regions. Faster progress in work to improve the environment, particularly air quality, is what people are desperately hoping for, and is critical to sustainable development. We must adopt well-designed policies, tackle both symptoms and root causes, and take tough steps to make the grade in responding to the people. We will make our skies blue again.This year, we will see that sulfur dioxide and nitrogen oxide emissions are both cut by 3 percent and that fine particulate matter (PM2.5) density in key areas falls markedly. We will step up work on upgrading coal-fired power plants to achieve ultra-low emissions and energy conservation. Upgrading should be completed this year in the eastern region, next year in the central region, and by 2020 in the western region. We will act quickly to improve our mechanisms and technologies, enabling us to prioritize the integration of clean energy sources into the electric grid and effectively address wasted hydro-, wind- and solar-power generation capacities. We will develop nuclear power in a safe and highly efficient way. We will also work faster to make comprehensive use of straw. Second, we will take a full range of measures to tackle the sources of pollution. We will take focused actions to curb pollution in key industries. We will place all key sources of industrial pollution under round-the-clock online monitoring, and ensure the quality of monitoring. We will set a clear deadline by which enterprises must meet required discharge standards, and take resolute law-based action to close down all those that still fail to meet standards after the deadline. Third, we will strengthen control over exhaust emitted by motor vehicles. We will see that basically all higher-emission vehicles are scrapped, work faster to take old vehicles off the roads, carry out dedicated initiatives to deal with high-emission vehicles, and encourage the use of clean-energy cars. We will improve the quality of fuels and move faster to promote the use of those that meet National-VI emission standards in key areas. Fourth, we will take effective steps to tackle heavy air pollution. We will strengthen analysis of sources of air pollution and research on the causes of smog to improve the scientific basis and precision of the steps taken. We will expand the coverage of mechanisms in key areas to ensure coordinated prevention and control efforts across regions, and enhance earlywarning and emergency response measures. Fifth, we will strictly enforce environmental laws and regulations, conduct inspections, and hold violators accountable. Illegal dischargers and fraud must be punished in accordance with law. Officials who do a poor job in enforcing the law, knowingly allow environmental violations, or respond inadequately to worsening air quality will be held fully accountable. We will strengthen the prevention and control of water and soil pollution.This year, chemical oxygen demand and ammonia nitrogen emissions should both drop by 2 percent. We will effectively prevent and control water pollution in key drainage basins, regions, and sea areas and agricultural pollution from non-point sources. We will undertake rigorous investigations on soil pollution and develop and implement category-based measures to tackle this problem. We will take comprehensive measures to improve both urban and rural environments, advocate green living, and promote waste sorting. We will strengthen energy conservation and environmental protection industries and develop green remanufacturing and circular industries to ensure both environmental improvement and economic growth. We will move forward with ecological conservation and improvement.We will act promptly to set redlines for ecological conservation and hold firm to these lines. We will work actively to respond to climate change. We will begin to pilot projects to improve the quality of our forests and restore ecosystems along the Yangtze Economic Belt, and launch the second group of trial projects to conserve the ecosystems of mountains, forests, farmland, rivers, and lakes. We will turn more than 800,000 hectares of marginal farmland into forests or grassland. We will address the spread of desertification and stony deserts. These initiatives will enable us to accumulate more ecological wealth and build a green Great Wall of sustainable development. We will strive to boost employment and business startups.We will improve employment policy, strengthen employment training, and increase support for flexible employment and new forms of employment. This year, 7.95 million students will graduate from college, the highest number on record. We need to effectively implement initiatives to promote their employment, to guide them in starting businesses, and to encourage them to work at the community level, providing our college graduates with multiple channels to find jobs or start their own businesses. We will implement and improve policies and see that demobilized military personnel are settled into new jobs. We will step up employment assistance to help vulnerable urban residents and people with disabilities find employment and to ensure that at least one member in every family currently with zero employment secures a stable job. Employment is crucial to ensuring people's wellbeing. We will focus our effort on facilitating employment to see that through their hard work, people can create wealth and realize their full potential. We will work to ensure that our people have access to equitable and quality education.We will combine the separate policies for rural and urban students receiving compulsory education that waive tuition and miscellaneous fees, supply free textbooks, and grant living allowances for boarders from financially disadvantaged families. We will make compulsory education accessible as a public service to all permanent urban residents, with and without local urban household registration. We will continue to improve conditions in badly built and poorly operated schools, and expand the reach of quality educational resources, so as to narrow the gap in the quality of education between urban and rural areas, different regions, and different schools. We will continue to expand the enrollment of students from poor rural areas at key colleges and universities. We will increase government grants for PhD students. We will strengthen efforts to develop more world-class universities and first-class fields of discipline. We will continue to encourage some undergraduate institutions to shift their focus toward providing applied education. We will pilot comprehensive reform of the college entrance examination system; accelerate the development of modern vocational education; ensure ethnic minorities improve their education; and make sure that we have good special needs education, continuing education, preschool education, and education for senior citizens. We will support the development of private education and work to ensure it meets all relevant standards. We will work to improve teacher performance. The Modernizing Chinese Education 2030 initiative will be developed and launched. We will develop education that satisfies the needs of our people, make the modernization of education underpin the modernization of our country, and see that more children realize their dreams and more families have their hopes fulfilled. We will make continued progress in building a Healthy China.We will increase both government subsidies for basic health insurance for rural and nonworking urban residents from 420 to 450 yuan per person per annum and personal contributions, and will expand the scope of this insurance to cover more medicines. We will accelerate the building of a nationwide information network for basic health insurance so that healthcare costs can be settled directly where incurred. We will improve the major disease insurance system and increase insurance benefits for subscribers. In promoting better health, we will continue to increase government subsidies for funding basic public health services and strengthen the development of the disease prevention system and the chronic disease prevention and control system. We will respond to public health accidents promptly, publicly, and effectively. We will work to ensure that medical practitioners remain motivated and that interactions between doctor and patient are amicable. As the policy of allowing couples to have two children has been adopted, we need to strengthen our maternity medical and healthcare services. We will support the development of traditional Chinese medicine on the basis of law. We will weave a strong safety net to ensure people's wellbeing.We will continue raising basic pension payments and see they are paid on time and in full. Standards for benefits for entitled groups and social assistance benefits will be steadily raised, and the emergency aid system will be fully implemented. We will adjust and improve the natural disaster subsidy mechanism, and finish the rebuilding of all houses damaged during flooding last year. We will strengthen efforts to ensure the care and protection of children who remain in rural areas while their parents work away in the cities and provide support for children living in difficult conditions in both rural and urban areas. We will provide care and assistance to the families of military personnel and revolutionary martyrs and elderly people who live alone. We will achieve full coverage in providing living allowances for people with disabilities in financial difficulty and nursing care subsidies for people with severe disabilities. County-level governments must put in place coordination mechanisms for meeting people's most basic needs. They must make sure there is a social cushion in place, letting those in real need feel support is there and see hope up ahead. We will use a combination of legal, administrative, and economic means to continue resolving the problem of wage arrears for migrant workers, never allowing their hard work to go unpaid. We will develop cultural programs and industries.We will foster stronger observance of socialist cultural and ethical standards, and continue to use the Chinese Dream and core socialist values to build consensus, pool energy, and strengthen our people's confidence in Chinese culture. We will work to ensure that philosophy, the social sciences, art, and literature develop and thrive, and promote the development of the press, publishing, radio, television, film, and archiving. We will develop new types of think tanks with distinctive Chinese features. We will implement the programs to keep fine traditional Chinese culture thriving and see that China's cultural relics and intangible cultural heritage receive effective protection and play fuller roles. We will work hard to foster a love of reading in our people and enable them to learn more about science. We will make basic public cultural services more equitable. We will speed up our work to develop cultural industries, strengthen regulation over cultural markets, and foster a healthy cyberspace environment. We will deepen personal and cultural exchanges with other countries and do more to share Chinese culture with other countries. We will make full preparations for the 2022 Winter Olympic Games and Paralympic Games in Beijing. We will promote coordinated development of recreational and competitive sports and sports industries, and launch extensive Fitness-for-All initiatives so that more people will enjoy sports and stay fit and healthy. When its people are healthy and optimistic, a country will certainly be full of vitality. We will explore new forms of social governance.We will improve the system of primary level self-governance and strengthen community governance in both urban and rural areas. We will see that trade unions, Communist Youth League organizations, women's federations, and other people's organizations fully play their roles. We will reform and improve the system for regulating social organizations, promote the healthy development of public-interest activities and charity on the basis of law, and promote specialized social work and volunteer services. The legitimate rights and interests of women, children, the elderly, and people with disabilities will be effectively protected. We will move faster to improve the social credit system, and work to heighten public awareness of rule of law and strengthen legal services. We will enforce the responsibility system for handling public complaints and see that justified demands are addressed promptly and locally in accordance with law. We will continue to pursue the Peaceful China initiative, improve the multidimensional, IT-based crime prevention and control system, crack down hard on violent terrorist activities, and punish organized crime,drug-related crime, and common crimes like theft, robbery, telecommunications and online fraud, and infringement of personal information, thus upholding China's national security and social stability. We will work to see that law is enforced in a strict, standardized, fair, and civil way, address prominent problems that endanger public security, and take comprehensive measures to ensure the security of our people. We will ensure workplace safety and protect people's lives.We must work with tireless dedication to ensure workplace safety. We will strengthen the development of safety infrastructure, and ensure the quality of work related to seismology, meteorology, surveying, mapping, and geology. To curb the occurrence of serious and major accidents and protect the lives and property of our people, we will strictly enforce the workplace safety responsibility system, and see that all responsibilities are fulfilled, namely, the primary responsibility of the enterprise itself, the regulatory responsibility of the government in the locality where the enterprise is located, and the oversight responsibility of the relevant government department. We will continue to work to see that government functions are fully carried out in accordance with law.Governments at all levels and all government employees must meet every requirement for fully advancing China's law-based governance. We must strictly observe the Constitution; we must hold the rule of law in the highest esteem; we must hold the law in reverence; we must conduct administration in accordance with law, and we must build a rule of law government. We will make government operations more transparent. We will ensure that policies are made in a sound and democratic way on the basis of law; and we will widely solicit input and criticism from all interested parties in policy making. We at all levels of government must subject ourselves, as required by law, to oversight by people's congresses and their standing committees at the corresponding levels, to the democratic oversight of CPPCC committees, and to public oversight and oversight through public opinion. We should willingly solicit input from deputies to people's congresses, members of CPPCC committees, other political parties, chambers of commerce, public figures without party affiliation, and people's organizations. As ours is a government of the people, all of our work must reflect their will, safeguard their interests, and be placed under their oversight. We will maintain ethical conduct and moral integrity at all times.We will continue to make every effort to fully strengthen Party self-governance, improve Party conduct and moral integrity, and effectively combat corruption. 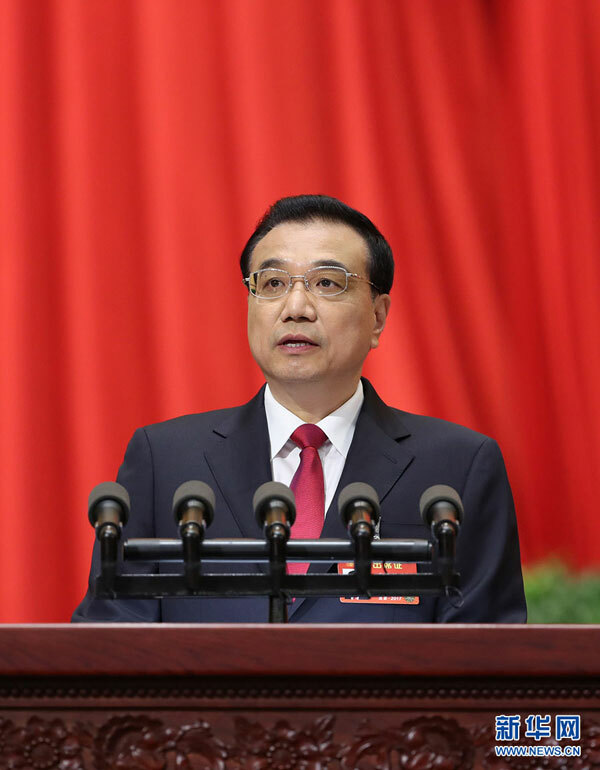 We will act with firm resolve to implement the Party Central Committee's eight-point decision on improving Party and government conduct, and make continued efforts to correct formalism, bureaucratism, hedonism, and extravagance. We will strengthen administrative supervision and auditing-based oversight. We will continue to maintain a tough stance against corruption. With the focus on key areas, we will conduct full investigations into and punish corruption and other forms of misconduct that undermine people's interests. All public servants must have integrity, be upright, and get on honestly with their jobs of serving the people. We will perform with a strong work ethic, sense of responsibility, and enterprising spirit.China's remarkable achievements in reform and development are the work of officials and the people; the only way to make new achievements is more hard work. Governments at all levels and all government employees must make it our priority to get things done. In performing duties, we should work hard, in a down-to-earth way; and we should be innovative as actual conditions allow. Implementing decisions made at meetings of higher-level authorities and contained in the documents they issue does not mean just holding more meetings and issuing more documents. It's no good to just push paper and pay lip service. We need to keep both the central government and local governments fully motivated, and encourage local governments to work according to local circumstances and be bold in their explorations, so that together we are all promoting sustainable and balanced development. We will strictly enforce the responsibility systems, particularly those for implementing key tasks. We must see responsibilities are fulfilled without fail, that pressure is felt at every level of government, and that implementation is carried out to the letter. We will strengthen oversight and accountability, take tough steps to address incompetence, inertia, and negligence, and resolvedly address failures to act in good faith in government work. We will improve mechanisms that give incentives and allow for and address mistakes so as to support those who are dedicated to their work and stand behind those who live up to their responsibilities. China is a unified country of many ethnic groups. We will uphold and improve the system of regional ethnic autonomy, fully implement the Party's policies concerning ethnic groups, and intensify our efforts to foster ethnic unity and progress. We will make sure celebrations to mark the 70th anniversary of the founding of the Inner Mongolia Autonomous Region are a great success. We will increase support for development in areas inhabited mainly by ethnic minorities. We will deepen efforts to boost development in the border regions to benefit the people living there. We will protect and develop the fine traditional cultures of ethnic minorities and support the growth of ethnic groups with smaller populations. We will encourage people of all China's ethnic groups to develop together and thrive together in the course of finishing the building of a society that is moderately prosperous in all respects. With people of all our ethnic groups living together in friendship, sharing in a common cause, and developing in harmony, the big family of the Chinese nation will enjoy more happiness. We will fully implement the Party's fundamental policy on religion, manage religious affairs in accordance with law, promote harmonious relations between religions, and encourage religious leaders and believers to actively involve themselves in promoting economic and social development. This year, in pursuing the Party's goal of strengthening the armed forces in a new era, we will work to build them through political work, strengthen them through reform, and ensure they are run by law. We will boost military training and preparedness, so as to ensure that the sovereignty, security, and development interests of China are resolutely and effectively safeguarded. We will uphold the Party's absolute leadership over the armed forces and uphold and implement the system whereby the Chairman of the Central Military Commission assumes overall responsibility over military affairs. We will enhance our capacity for innovation in defense-related science and technology and step up the development of advanced logistics and equipment. We will strengthen national defense education among the general public, and step up national defense mobilization and readiness of reserve forces. We will continue to promote coordinated, balanced, and compatible development of the economy and national defense, deepen structural reform of defense-related science and technology industries, and intensify military-civilian integration. We at every level of government should take more solid and vigorous steps to support the reform and development of our national defense and armed forces. We should see that the tree of unity between the military and the government and between the military and the people continues to grow deep roots and is always in blossom. We will continue to implement, both to the letter and in spirit, the principle of "one country, two systems," under which the people of Hong Kong govern Hong Kong, the people of Macao govern Macao, and both regions enjoy a high degree of autonomy. We will continue to act in strict compliance with China's Constitution and the basic laws of the Hong Kong and Macao special administrative regions; and we will ensure that the principle of "one country, two systems" is steadfastly applied in Hong Kong and Macao without being bent or distorted. The chief executives and governments of the two regions have our full support in exercising law-based governance, growing their economies, improving people's wellbeing, advancing democracy, and promoting social harmony. The notion of Hong Kong independence will lead nowhere. We will promote closer cooperation between the mainland and Hong Kong and Macao. We will draw up a plan for the development of a city cluster in the Guangdong-Hong Kong-Macao Greater Bay Area, give full play to the distinctive strengths of Hong Kong and Macao, and elevate their positions and roles in China's economic development and opening up. We have always had full confidence about ensuring lasting prosperity and stability in Hong Kong and Macao. We will thoroughly implement the policies on our work related to Taiwan, uphold the one-China principle, and safeguard the 1992 Consensus as our common political foundation. We will protect China's sovereignty and territorial integrity, maintain the peaceful growth of cross-Straits relations, and safeguard peace and stability in the Taiwan Straits. We will resolutely oppose and deter separatist activities for Taiwan independence. We will never allow any person to separate Taiwan from the motherland in any form or name. We will contribute to a framework that ensures the overall stability and balanced development of relations between major countries. We will endeavor to foster a neighboring environment that enhances mutual trust and common development between China and its neighbors, upgrade cooperation with all other developing countries in all fields, and offer constructive proposals for addressing global and regional hotspot issues. We will intensify efforts to improve our mechanisms and capacity for protecting China's rights and interests overseas. China is ready to join hands with the international community and build a new type of international relations based on cooperation and mutual benefit and make new contributions to building a community of shared future for all humankind. A new historical mission awaits us, and with hard work we will achieve great success. We will rally even closer around the Party Central Committee with Comrade Xi Jinping at its core, and work hard with one mind and an enterprising spirit to fulfill this year's economic and social development tasks and targets. Let us work with tireless dedication to achieve the two centenary goals (Note: This refers to completing the building of a moderately prosperous society in all respects by the time the Communist Party of China celebrates its centenary in 2021 and turning the People's Republic of China into a modern socialist country that is prosperous, strong, democratic, culturally advanced, and harmonious by the time it celebrates its centenary in 2049), build China into a modern socialist country that is prosperous, strong, democratic, culturally advanced, and harmonious, and realize the Chinese Dream of national rejuvenation.